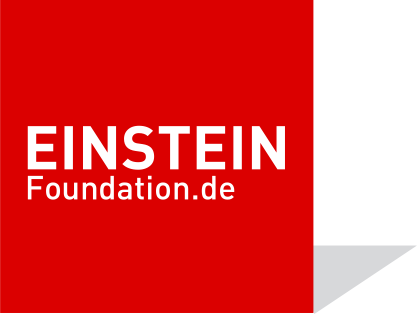 Supported by the Einstein Stiftung and the DFG via SFB/TRR 109. All talks will take place in lecture hall MA 041 on the ground floor of the math building. Conference room MA 875, 8th floor of the math building, is available for further discussions. Possible place for lunch: Staff cafeteria, 9th floor of the math building (on your own account). Optimal transport is a powerful mathematical tool at the interface between calculus of variations, probability and partial differential equations. In the recent past concepts from finite dimensional classical geometry have been successfully transferred to infinite-dimensional spaces, where shapes are seen as probability densities, or where raw measurements are seen as discrete measures, i.e., distribution of masses. After having impacted image analysis, optimal transport may reveal relevant for geometry processing as well, opening the door to solving increasingly complex problems. In my talk I will present a novel approach for computing a homeomorphic map between two discrete surfaces. While most previous approaches compose maps over intermediate domains which result in suboptimal inter-surface mapping, we directly optimize a map by computing a mass transport plan between two surfaces. Information transfer between triangle meshes is of great importance in computer graphics and geometry processing. To facilitate this process, a smooth and accurate map is typically required between the two meshes. While such maps can sometimes be computed between nearly-isometric meshes, the more general case of meshes with diverse geometries remains challenging. We propose a novel approach for direct map computation between triangle meshes without mapping to an intermediate domain, which optimizes for the harmonicity and reversibility of the forward and backward maps. Our method is general both in the information it can receive as input, e.g. point landmarks, a dense map or a functional map, and in the diversity of the geometries to which it can be applied. We demonstrate that our maps exhibit lower conformal distortion than the state-of-the-art, while succeeding in correctly mapping key features of the input shapes. Joint work with Danielle Ezuz and Justin Solomon. We present a provably convergent linear algorithm for computing conformal mappings of surfaces with disc or spherical topology to an appropriate canonical domain. Our algorithm is based on a specific choice of canonical domains: Euclidean orbifolds. Using the symmetry properties of Euclidean orbifolds, we characterize the conformal mappings as the unique minimizers of the Dirichlet energy over an appropriate set of affine functions. By applying fairly standard finite element techniques we obtain discrete conformal mappings which converge to the conformal mapping in H^1 for regular, not necessarily Delaunay, meshes. For Delaunay meshes we further prove uniform convergence and show the discrete conformal mappings are guaranteed to be homeomorphisms. In this talk, we will discuss model reduction techniques that can be used to design fast approximation algorithms for shape optimization problems. The goal is to obtain approximate solutions at run times that are independent of the resolution of the discrete shapes to be optimized. As applications we will discuss methods for real-time elasticity-based shape interpolation and the processing of curves in shape spaces in which a shape is a single point. Finally, I will outline the concept of compressed vibration modes of elastic bodies, which in contrast to the natural vibration modes, are localized ("sparse") deformations. In this presentation, I'll talk about an on-going research project at the frontier between physics, math. and scientific computing, on new methods for early universe reconstruction. Early universe reconstruction aims at confronting some astrophysical theories with reality by taking observations and making them go "back in time". Interestingly, the corresponding computational problem exactly corresponds to a form of optimal transport, a topic with recent developments on both its theoretical and computational sides. - red-shift acquisition surveys, that map galaxy clusters by measuring the speed at which they evade from us based on the shift of star's spectra due to Doppler's effect. With Hubble's law, one can deduce the distance from the speed. - the cosmic microwave background, a radiation emitted at the early ages of the universe, that contains an imprint of its heterogeneities at that time. Early universe reconstruction starts with a "map of the universe" obtained through a red-shift acquisition survey, represented by a pointset (typically with tenths of million points, each point corresponding to a galaxy cluster), and determines how the matter that corresponds to each galaxy cluster traveled from the initial time. Then confronting this reconstruction with the cosmic microwave background can reveal inconsistencies in the models. Making an additional approximation (that the Hubble drag exactly counterbalances gravitational acceleration), one obtains the Monge-Ampère equation, that is equivalent to Monge's Optimal Transport problem [Brenier]. This specific configuration of Optimal Transport (constant density transported to galaxy clusters represented by Dirac masses), is called "semi-discrete". Semi-Discrete Optimal Transport has a nice structure, and can be stated in dual form as the maximization of a smooth (C^2) concave function of values attached to each galaxy clusters (physically they correspond to the gravity potential). This function is optimized by a Newton algorithm with provably-good step-length control [Kitagawa Mérigot Thibert]. Evaluating this function and its derivatives boils down to compute the volumes (resp. areas) of the cells (resp. faces) of a Laguerre diagram, a classical structure in computational geometry that can be computed by efficient algorithms. This work is done in the frame of the MAGA and EXPLORAGRAM projects, in cooperation with Q. Mérigot, Y. Brenier, J.-D. Benamou, R. Mohayaee and J.-M. Alimi. A long-standing challenge in scene analysis is the recovery of scene arrangements under moderate to heavy occlusion, directly from monocular video. The problem is inherently ill-posed. Over decades, researchers have studied the use of various regularizers in the form of transformation groups (e.g., symmetry types), data priors (e.g., database shapes), functional priors (e.g., object affordance), etc. In the last years, we have been investigating the utility of physics-based priors to recover occluded geometry in an effort to extract semantic scene understanding from raw (dynamic) inputs. In this talk, I will report our recent results on this topic. For more information, please visit http://geometry.cs.ucl.ac.uk/. We will present an overview of ongoing research at TU Wien on discrete structures which are motivated by architectural projects, but are also interesting objects of discrete differential geometry without this specific application. The topics include various smoothness concepts for polyhedral surfaces, structures from simple and repetitive elements, structures in force equilibrium and discrete structures with non-linear faces and edges. We present very recent advances on deformable partial 3D shape correspondence in the spectral domain. The talk will be structured in two parts. First, we will introduce Partial Functional Maps (PFM), showing how to robustly formulate the shape correspondence problem under missing geometry with the language of functional maps. We use perturbation analysis to show how removal of shape parts changes the Laplace-Beltrami eigenfunctions, and exploit it as a prior on the spectral representation of the correspondence. We will show further extensions to deal with the presence of clutter (deformable object-in-clutter) and multiple pieces (non-rigid puzzles). In the second part, we will introduce a novel approach to the same problem which operates completely in the spectral domain, avoiding the cumbersome alternating optimization used in the previous approaches. This allows matching shapes with constant complexity independent of the number of shape vertices, and yields state-of-the-art results on challenging correspondence benchmarks in the presence of partiality and topological noise. In this talk I will discuss using deep learning methods for physics problems, and outline research directions to alleviate the inherent difficulties of fluids simulations with the help of deep convolutional neural networks. As powerful tools to approximate complex nonlinear functions these networks can enable new directions of working with fluid simulations. I will show several recent examples of how fluid simulations and neural networks can work together, e.g., to synthesize new simulations with pre-computed patches of flow data, or to enable interactive liquids applications by warping space-time surfaces. In the end, I will also discuss possible future directions for this area. While it is difficult to predict how soon deep learning methods will hit an inevitable ceiling in terms of the representative powers, the combination with physics offers a variety of new and interesting challenges beyond those encountered in areas where such methods have been applied predominantly in the past. For the design of 3D structures in building construction and architecture it would be very beneficial if optimization and side conditions involving statics and geometry could play a role already in early stages of design. This talk discusses a step towards this goal. We combine the classical work of Maxwell, Michell, and Airy with differential-geometric considerations and obtain a geometric understanding of optimality of surface-like lightweight structures. We also treat the modeling of structures of minimal weight which in addition have properties (like planar panels) relevant to building construction. Over the past decades, a large amount of research in geometry processing has been dedicated to computational tools for processing single geometries. From a more global perspective, one might ask to study surfaces as points in a space of shapes. Over the past years, concepts from Riemannian manifolds have been applied to design and investigate shape spaces, with applications to shape morphing and modeling, computational anatomy, as well as shape statistics. Studying shape space from the point of view of Riemannian geometry enables transfer of important geometric concepts, such as shortest paths or curvatures, from classical geometry to these (usually) infinite-dimensional spaces of shapes. In my talk I will highlight some of the recent developments and open questions in understanding shape space from a Riemannian perspective, with a particular focus on how one can relate Riemannian metrics to elastic energies. I will present recent work on scalable system designs for generating 3D objects using topology optimization. This enables to efficiently evolve the topology of high-resolution solids towards printable and light-weight-high-resistant shapes. Furthermore, I will shed light on the simulation of porous structures such as trabecular bone, as they occur in nature due to force-induced material growth. These structures are lightweight and exhibit strong mechanical properties. I will present a new method to generate bone-like porous structures as lightweight infill for additive manufacturing. The method builds upon and extends voxel-wise topology optimization, yet for the purpose of generating sparse and stable structures it introduces upper bounds on the localized material volume in the proximity of each voxel in the design domain. Local constraints are then aggregated into an equivalent global constraint, in order to facilitate an efficient optimization process. I will conclude my talk with some thoughts on the use of topology optimization for generating stress-aligned structures, and for using such structures for stress visualization. This talk concerns to problem of efficiently simulating small-amplitude waves on the surface of a body of water. For the past few decades, the state of the art in computer animation has been to either approximately solve for the motion of the waves using finite differences, or to solve an extremely simplified version of the problem exactly (via a Fourier transform). I will discuss a few alternative strategies for solving this problem, based on geometric optics, wave packet theory, and wavelet transforms. These new techniques are able to simulate water surface waves with virtually unlimited visual detail, interacting with complicated boundaries at real-time rates. The Einstein workshop will take place at lecture hall MA 041 of the Institute of Mathematics at Technische Universität Berlin, Strasse des 17. Juni 136, 10623 Berlin. View map. The lecture hall will be sign-posted. The Einstein workshop is organized by Pia Janik and Sabine Hunke at the TU Berlin. Exit the A 100 at the Kaiserdamm exit and drive along Kaiserdamm street (it later changes its name into Bismarckstrasse) for approximately 2 km in the direction of Ernst-Reuter-Platz, until you reach the roundabout. For the hotel: Take the first exit in the roundabout onto Hardenbergstrasse and shortly after turn into the second street on the right onto Knesebeckstrasse. After a few metres you will see the Hotel Gates on the right-hand side. For the Math Institute: Take the second exit in the roundabout onto Strasse des 17. Juni and follow the street for a few metres until shortly before the bridge and make a U-turn there. Follow the street for a few metres back; the Math Institute will be on your right-hand side. There is a public parking area directly at the Math Building. Please note: On 8 April 2018 until about 13:00h Ernst-Reuter-Platz and Strasse des 17. Juni will be blocked due to the Berlin Half Marathon! From Berlin Hauptbahnhof take either the S3, S5 or S7 tube line towards Spandau (S3), Westkreuz (S5) or Potsdam (S7) as far as Zoologischer Garten. Here change to the U2 tube line towards Ruhleben/Theodor-Heuss-Platz and exit at Ernst-Reuter-Platz. For the hotel: Exit the underground station in the direction of “Otto-Suhr-Allee”; leaving the tube station turn left and walk into Hardenbergstrasse up to the second street on the right – this is Knesebeckstrasse. For the Math Institute: Exit in the direction of “Technische Universität, Campus Charlottenburg”, go straight and cross the Strasse des 17. Juni at the next light; turn right and keep going for a few metres; the Math Institute will be on your left-hand side. Travel time approx. 20 minutes; required single ticket: travel zones AB for EURO 2,80. Please note: In the morning of 8 April 2018 there will be some delays on public transport due to the Berlin Half Marathon. 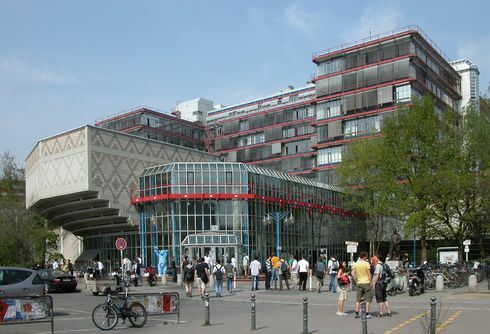 From Tegel airport you can take Expressbus X9 towards Zoologischer Garten and get off at Ernst-Reuter-Platz. For the hotel: Continue in the direction the bus was going and turn right onto Knesebeckstrasse. For the Math Institute: Turn the opposite direction and cross the Hardenbergstrasse at the first light. Go straight and cross the Strasse des 17. Juni at the next light, turn right and keep going for a few metres; the Math Institute will be on your left-hand side. Travel time approx. 20 minutes; required single ticket: travel zones AB for EURO 2,80. Please note: If you travel in the morning of 8 April 2018, you will have to make a detour due to the Berlin Half Marathon (until 12:58h). 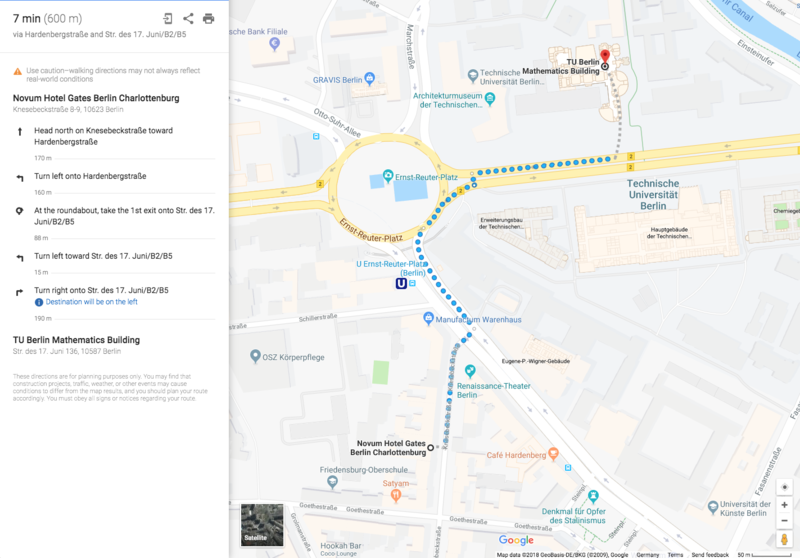 Possible connection from Tegel Airport during Half Marathon: Take Expressbus X9 towards Jungfernheide and get off at Jakob-Kaiser-Platz. Here change to the U7 tube line in the direction of Möckernbrücke and change at Bismarckstrasse to the U2 tube line in the direction of Pankow; get off at Ernst-Reuter-Platz. For the hotel: Exit the underground station in the direction of “Otto-Suhr-Allee”; leaving the tube station turn left and walk into Hardenbergstrasse up to the second street on the right – this is Knesebeckstrasse. The fastest connection is from the neighbouring Schönefeld train/S-tube station (walk approx. 9 minutes). From there take either train RE7 or RB14 towards Brück (RE7) or Nauen (RB14) as far as Zoologischer Garten. Here change to the U2 tube line towards Ruhleben/Theodor-Heuss-Platz and get off at Ernst-Reuter-Platz. For the hotel: Exit the underground station in the direction of “Otto-Suhr-Allee”; leaving the tube station turn left and walk into Hardenbergstrasse up to the second street on the right – this is Knesebeckstrasse. For the Math Institute: Exit in the direction of “Technische Universität, Campus Charlottenburg”, go straight and cross the Strasse des 17. Juni at the next light; turn right and keep going for a few metres; the Math Institute will be on your left-hand side. Travel time approx. 60 minutes; required single ticket: travel zones ABC for EURO 3,40. Please note that this connection is only available every 20-40 minutes. In between there are additional S- and U-tube connections with several changes of lines; they take approx. 10 minutes longer. Please do not forget to validate your ticket by stamping it at the yellow or red boxes near the ticket machines before starting your journey.